This week Google released their latest version of Google Maps for Android. One of the most prominent changes can be found in the Google Maps Navigation mode. Google introduced live traffic data within their routing. 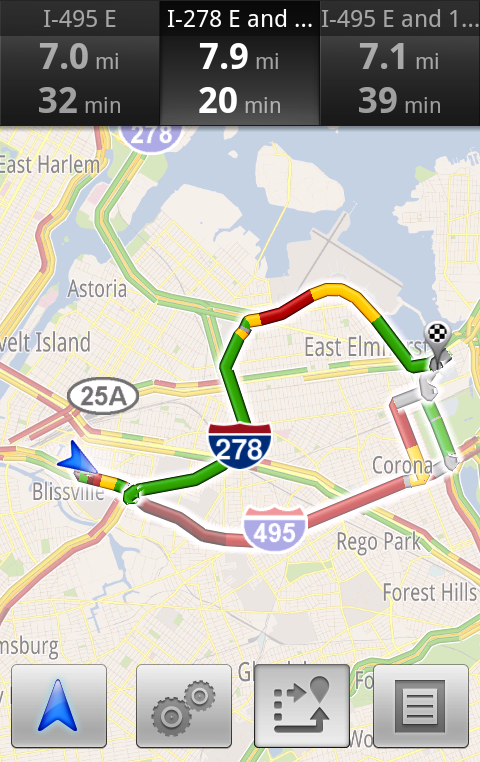 Google Maps for Android advise you to take an alternative road if heavy traffic is on the road you are currently on. Even better it suggest a route where traffic is ok, and you will not become stuck on a road with heavy traffic. Data from the application is used to derive actual traffic density on individual road segments. Google Maps navigation is uses for more than 35 million miles driven by users every day. So this service is expected to become better by the amount of drivers using Google Maps as their navigation system. Of course this information will be used in the web application of Google Maps as well and we can expect a better coverage of live traffic data for the entire world soon. alternative route beta feedback traffic Google Maps Navigation live traffic traffic density. Labels: alternative route beta feedback traffic Google Maps Navigation live traffic traffic density.